Below is a size chart provided by HJC for this product. If you need help with how to measure, or how to evaluate the fit of a helmet please have a look at this guide by HJC (the size chart included in this guide is for a “generic” HJC helmet and may differ slightly from the chart below that is specific to this product). 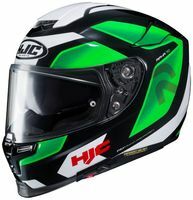 Use With: These sunshield visors will work with HJC RPHA ST and the HJC RPHA 70 ST helmets. You can replace the sunshield visor in your helmet if it gets scratched or blemished.